A Chrome extension that removes faces and names from LinkedIn to reduce the effects of unconscious bias. Unbias hides faces and names from profiles, searches, recruiter searches and recruiter projects on LinkedIn, to reduce the effects of unconscious bias on recruiters. Once you've activated the Chrome Extension the blue Unbias icon will appear to the right in Chrome toolbar (by the search/URL bar), so you know it's working. Clicking the icon easily toggles Unbias on and off. Unconscious (or implicit) bias is bias we are unaware of - it's outside our control, but affects our actions and decisions. Studies show we have unconscious bias toward or against certain genders, ethnicities or visual traits. You can test your own unconscious biases with Harvard's Implicit Association Test. Goldin & Rouse found blind auditions for orchestras increased the likelihood that a woman is selected by 30% to 60% - how about blind applicant finding and filtering? In addition, studies have shown that we have biases based in names. Moss-Racusin et al. found, in a double-blind study of the the same application with typically male and female names, like James and Jane, that assessors rated James as significantly more competent and hireable than the (identical) Jane. The assessors also selected a higher starting salary and offered more career mentoring to James. And it didn't matter whether the assessor was a man or a woman - we are all affected by unconscious bias. Equally, Bertrand and Mullainathan found significant discrimination against African-American sounding names: White sounding names received 50 percent more callbacks for interviews. And this affected the benefits of a better resumé too - a higher quality resumé elicits 30 percent more callbacks for a White-sounding name, whereas for African American sounding names, it elicits a far smaller increase. 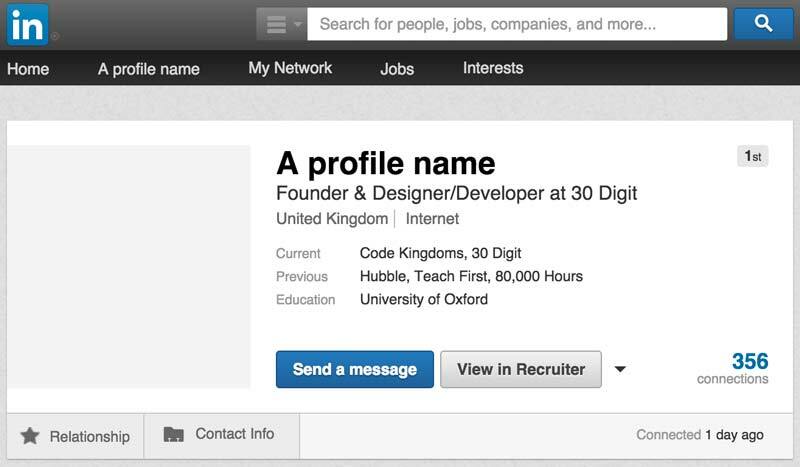 Recruiters use LinkedIn to find, shortlist and contact candidates. As LinkedIn displays both names and profile photos, recruiters are susceptible to this bias. It may affect whether or not they choose to shortlist or contact a candidate, and their overall perception of a candidate's ability, outside of the relevant facts about that candidate. Unbias removes names and photos in both standard and recruiter account searches and profile views to help reduce the effects of unconscious bias. Unbias is created by show name, a developer based in London.